Okay, I have an MTIO art collection. And what's an MTIO art collection without a page with Ben yelling his patented battle cry "It's Clobberin' Time!"? 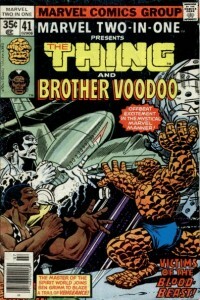 Besides, this page also has Brother Voodoo, Idi Amin, and Ben crashing yet another plane. How can you go wrong? I picked this up in May, 2003 from The Artist's Choice, along with the three pages from issue 37. 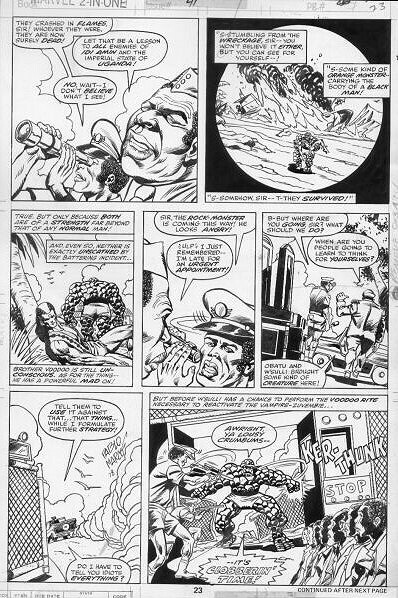 Last time I checked, they still had a nice variety of Pablo Marcos inked MTIO pages, and they were very easy to do business with.